The Rose Garden Pavilion & Lawn is one of our favourite wedding ceremony locations and a hugely popular garden ceremony venue. The Rose Garden is in bloom from September to May making it ideal if you have a love of beautiful roses. That aside, you’ll love this venue for its location and versatility when creating your wedding ceremony setup. There are so many different directions the wedding ceremony aisle can run on this beautiful lawn. Face north and the aisle runs towards Sydney Harbour with the bride walking down the aisle towards the Sydney Harbour Bridge. Face south and the wedding aisle the guests will be looking back towards the Harbour Bridge as the bride walks towards them. Facing east and the ceremony aisle runs towards the spectacular rose garden. And that’s not all, there’s a beautiful old fig tree just to the left of the rose garden pavilion (when facing south) that you can position a ceremony setup under on a hot day for shade. There are just so many variations to this stunning wedding ceremony garden that we highly recommend an onsite consultation when you book so we can walk you through the different setups. The majority of brides and grooms utilise the Rose Garden Lawn directly in front of the pavilion and run the wedding ceremony aisle south towards the rose garden pavilion with the Sydney Harbour Bridge in the background. The Rose Garden Pavilion & Lawn has heaps of space to add more padded white chairs to the wedding setup. With so much available space our 9m x 1.5m aisle runner is perfectly suited to the location. The length is especially important to ensure the space feels fully utilised. Once the direction of your wedding ceremony aisle has been chosen and your aisle runner colour is locked in (White, Red or Black) you will need to add in your ceremony decorations to border the aisle. Adorable Wedding Concepts have a range of wedding hire and decoration settings available. All of our wedding ceremony packages come with the low lying floral aisle settings and the Elegance ceremony package, which we have recommended for the Rose Garden & Pavilion, has the added shepherds hooks and decorations with your choice of Crystal Lanterns, Floral Balls or buckets as inclusions, so all you need to do is choose the style you want for your wedding ceremony. Our floral urns & pedestals, another inclusion in the Elegance ceremony package, can be placed either at the start of the wedding ceremony aisle or at the opposite end where they can border the bride and groom during the ceremony, either way they are great inclusion and make excellent ceremony props for photographers. Adorable Wedding Concepts can customise the floral arrangement of the urns and we have several urns & pedestals available for wedding hire. Discuss your ceremony ideas with our wedding stylist when you enquire and they can advise you on the best urns and pedestals to use at the Rose Garden & Pavilion. We recommend booking early if you want to secure the Rose Garden & Pavilion at the Royal Botanic Gardens Sydney for your outdoor wedding ceremony. There are alternatives available if the Royal Botanic Gardens Sydney is your chosen wedding ceremony venue. Have a look at the Herb Garden & Pavilion if you have a small ceremony or Bennelong Lawn for larger setups. Any of the gardens within the Royal Botanic Gardens are suitable so we’re sure you won’t be disappointed no matter the garden wedding location you go for. We look forward to hearing from you, either call 0418 624 225 or go to our enquiry page and send us an email for an obligation free quote and consultation. 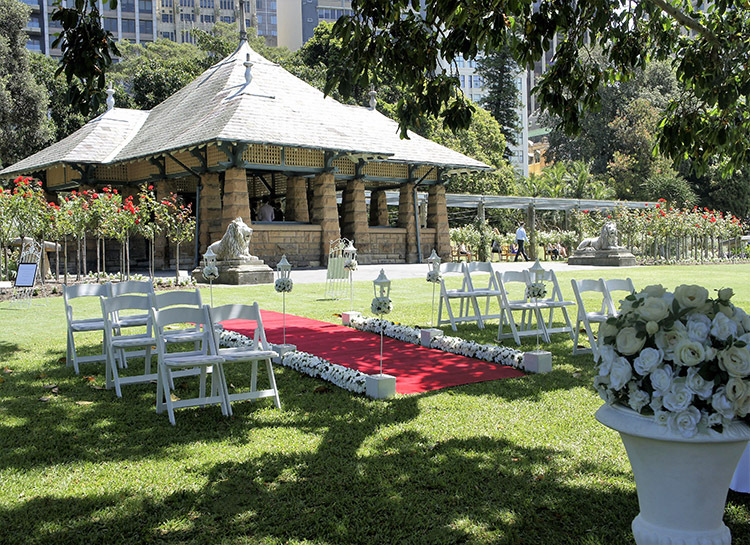 Unsure about the Royal Botanic Gardens Rose Garden & Pavilion as a venue? Contact us to discuss the style of wedding and type of venue you are looking for and we can provide you tips and insights from our 15 years of experience in the wedding ceremony industry. Guest Access: The Rose Garden Pavilion & Lawn at the Royal Botanic Gardens is accessed from the Palace Garden, Morshead Fountain and Conservatorium gates (all accessible off Macquarie Street). What you need to know: Royal Botanic Gardens allow 1 hour setup prior to the start of the ceremony booking time and will not allow access prior unless special prior arrangements have been made which involve additional site booking fees. The Rose Garden & Pavilion is one of the few venues anywhere in Sydney with its own private toilets and a backup wet weather area (Pavilion) onsite. This makes it the perfect venue for your wedding ceremony hire.